Italy started the transition from analog to digital TV in mid 2009. Six months later, the transition is still ongoing and causing a lot of hassles, unplanned expenses and, above all, confusion. In a few months Italians found themselves in a situation where, to receive all the channels available through satellites and terrestrial digital TV providers, every TV should be equipped with nine (9!) extra digital decoders!. This mess prompted Italian Senator Vincenzo Vita to propose a law that would mandate that every TV show, be it free or “pay per view” should be viewable with the same decoder, regardless of the transmission channel (terrestrial digital, satellite and so on). The hassles caused by the switch off of analog TV may be the right stimulus to just stop wasting time watching TV, but we digress. The sooner a universal TV decoder arrives the better, since having all that extra hardware at home pollutes and makes us waste more electricity than [what we’re already wasting thanks to uncompatible phone chargers ]. Even a universal decoder, however, would be unable to make digital TV interactive, especially if we all keep looking at the decoders and not to where we plug them. Those fancy extra buttons on digital remotes should allow people to “interact”, that is to participate to TV shows and purchase product and services throught their TVs. Other uses for the same buttons include distance learning, requests for certificates and other public documents and home banking. All from the good, old living room TV. Cool, huh? Except for the fact that all this interactivity (which incidentally is already available through that Internet thingy) always has the same, big limit. Who decides what you can see and who you can talk with is always and only the guy at the other side of your antenna. It’s like they sold cell phones or phone land lines able to only call some shopping mall or public office. Above all, with a TV, digital or not, you can’t find or correlate whenever you want lots of really interesting informations. 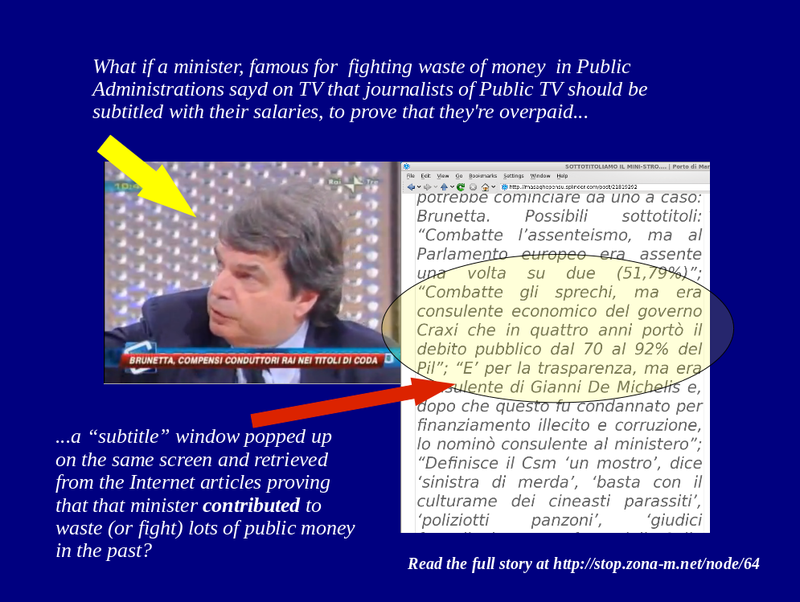 Let’s make a practical example: on December 2nd, 2009, Italian Minister Renato Brunetta declared during a TV talk show that all anchormen and journalists RAI, the State-controlled TV network, should be regularly subtitled… with their salaries, so taxpayers would realize how much of their money is spent on them. Two days later Italian journalist Marco Travaglio replied that it is politicians, starting from Brunetta himself, who should always be subtitled with relevant information, in order to allow all citizens to check in real time the mismatch between what they say and what they actually do or did in the past. As an example, says Travaglio, it would be interesting to see on TV, every time Brunetta promotes his anti-slackers campaign to reduce the waste of public money an instant reminder that “he was a consultant of the Craxi administration which in the eighties let the National Public Debt go from 70 to 92% of the Italian GNP in four years”. Being able to check such facts by ourselves would be wonderful but it’s impossible: we should personally read all magazines and newspapers, watch all TV news and shows, remember everything perfectly for decades and keep paper or DVD copies of all that material, as evidence of changes of minds or contradictions. Getting the same information from any TV, digital or not, is equally impossible. Subtitles can only show very short sentences and in any case they are written by the same people who broadcast the news, so we wouldn’t gain anything as far as transparency and complete information are concerned. Now, that picture is only a mockup, but can you imagine the possibilities? If we watched the news on a computer monitor we could configure that computer to always show, in real time and almost automatically, third-party proofs or refutations of everything politicians say on TV! Can you imagine watching your favourit talk show on screens that, as soon as somebody says “I never was in favour of such laws”, can immediately open a windows with links to all the interviews or voting records on the same topic for that person, straight from the archives of Public Administrations and private media? Can you imagine how differently politicians would work if they knew that they’re always under this kind of control? A control, mind you, almost automatic and above all independent from whoever controls the TV station. This is not science-fiction. Configuring a normal personal computer to actually do what the picture above suggests, which is much more than what Travaglio asked for, it is already possible and not so hard today. Unfortunately, knowing this fact will be almost useless until the day that everybody who can do it starts watching TV on the screen of a computer connected to the Internet, instead of the same old, stupid television sets. One thing I don’t like in Brunetta’s record is his deal with Microsoft to “support” Italian public schools. This said, I used Brunetta’s declaration as the center of this article only because what he said and Travaglio’s answer were too perfect as a practical example of what I had wanted to say for a long time to not use them. Note to English-speaking readers: if you want to create other examples using real cases from your country, please let me know and I will publish your pictures here or add links to them, as you prefer. In the meantime, please give printed copies of this page to all your relatives, friends and co-workers who can’t live without a state-of-the-art TV but still think that computers and the Internet are basically useless outside the office.